This website adopts web accessibility design and conforms to the World Wide Web Consortium (W3C) Web Content Accessibility Guidelines (WCAG) 2.0 Level AA standard. We are committed to ensuring that our website conforms to the World Wide Web Consortium (W3C) Web Content Accessibility Guidelines (WCAG) 2.0 Level AA requirements to the maximum extent possible. However, as our website contains dynamically generated map contents, it is not possible to incorporate all Level AA accessibility requirements in all of them. Nonetheless, the multi-media contents are so located as not to affect the accessibility of significant contents in our website. You are welcome to voice out your views on the underground space development and make contributions to the Strategic Urban Areas. What are the major community needs in the four strategic urban areas? Do you agree the major community needs could be addressed by underground space development in the strategic urban areas? What are your vision and expectation of underground space development? What are your concerns on underground space development in the four strategic urban areas? 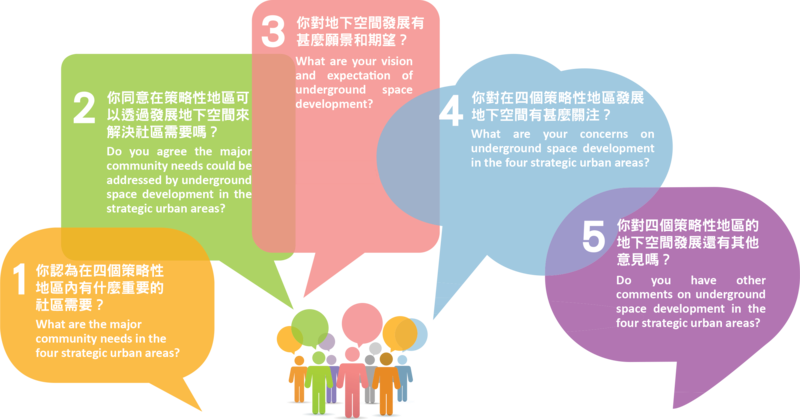 Do you have other comments on underground space development in the four strategic urban areas? Disclaimer: A person or an organisation providing any comments and suggestions to the Civil Engineering and Development Department or the Planning Department on the “Pilot Study on Underground Space Development in Selected Strategic Urban Areas” shall be deemed to have given consent to the Civil Engineering and Development Department or the Planning Department to partially or wholly publish the comments and suggestions (including the names of the individuals and organisations, but the telephone number and email address will be kept confidential). If you do not agree to this arrangement, please state so when providing comments and suggestions. Please wait, your opinion is being processed. Your comments have been submitted successfully.